HOH Corporation designs and fabricates Soil Vapor Extraction (SVE) Systems to meet every customer's specification. Standard HOH packages are capable of a wide variety of flows and pressures. Every HOH SVE System is fully assembled and tested for function, performance, and safety. 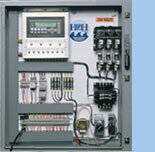 A powerful but compact PLC with a 2 line 20 character operator interface. HOH has designed this system with the operator in mind with simple setup and operation. All systems set points can be set by operator, NO NEED FOR A LAPTOP. This "Stand-Alone" system is designed to "Think for itself" in remote or populated areas. HOH can design and fabricate a system to fit your needs. Whether it's a system evaluation, equipment retrofits, or a complete system upgrade, HOH's comprehensive array of capabilities provides customers with the best, most cost-effective solutions to meet your specific needs.